Savor the fruits of the V&A green balcony with us | Vandewalle & Associates, Inc.
MADISON, WI: Vandewalle & Associates is once again supporting a green balcony for the 2018 summer season. Currently we are harvesting and snacking on three different varieties of delightful cherry tomatoes. 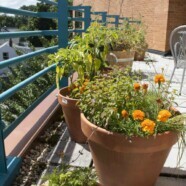 We also have a tidy crop of peppers, parsley and marigolds adding a bit of color to our outdoor space. Come check it out and savor a sample.